Theme: Improving public services for the city of Espoo. 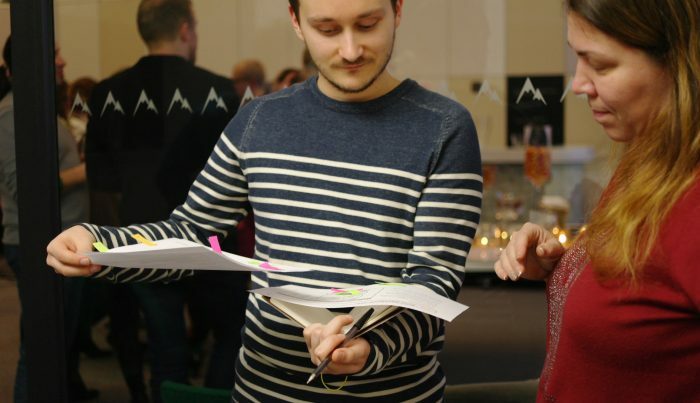 The Designing for Services course took place in spring 2018 and was once again arranged in collaboration with the City of Espoo. Five student groups worked on briefs provided by the City of Espoo, each related to different areas in Espoo and challenges related to them. The projects were carried out in the time scope of six weeks. Our client FEU, the Finnish Education Unit of Espoo (SUKO in Finnish), is running the KYKY co-creation model, which aims at enabling co-creation between schools and companies. FEU has noticed that the companies are very eager to participate in the KYKY platform activities, but that the schools are not active in generating ideas and starting cooperation. Hence, we were invited to figure out how to make KYKY more attractive to school communities. The original brief was focused on Rantaraitti, a 40 km pathway along the waterfront of Espoo. In the near future, it can be expected that Rantaraitti will have a lot more users due to the development plan of the metro line and city bikes. At the moment, there is no proper place for grilling along the Rantaraitti. However, there are several traces of it happening. Since the unauthorized grilling causes not only trash but also a safety hazard if the fire is left unmonitored, the provision of proper places for this purpose are required for the city. Our team was asked to create a grilling and campfire network along the Rantaraitti area. Finnoo is a new development area that has it all: nature, wildlife, metro and central location, seashore and marine-life. But how to deliver this message to people and keep it up in the future? 17 000 new inhabitants and rapidly growing neighbourhood need various services to make the best out of their life and residence in Finnoo and thus the team was asked to find out how to create and keep up a “Finnoo feeling” for the area and the future residents, visitors and other relevant stakeholders. What kind of services would make people fall in love with Finnoo and nudge them to make it even better? Active citizenship builds up the community spirit. How to create an enduring community culture? Leppävaara is a major center in Espoo and it is going to grow into a true city center in the coming decades. To guide the planning in Leppävaara, the city of Espoo has published Leppävaara Vision, a bold plan to develop the area to provide homes and spaces for a total of 100,000 inhabitants and 20,000 jobs. In the heart of Leppävaara is the Sports Park, a hub of activity that will gather more than 2,000,000 visitors this year. The city wants to bring visitors into the park through one main fairway, a promenade leading in from the train station. As a part of the vision, this route will be renovated to encourage meetings between people, bring tourists into Leppävaara, and bring more revenue for local businesses. This concept proposal aims to provide a set of guidelines to support the design-related decisions and planning concerning not only the promenade leading to the sports park, but the park itself, and northern Leppävaara in general, during and before the implementation of Leppävaara Vision. The overarching goal of this concept is enabling the kind of active, urban life, that is characteristic of city centers, and lifting up the opportunities for local services and businesses, in the whole area. Our team was tasked with addressing the opportunities and challenges associated with the relocation of six organizations into the A Grid facility, a start-up accelerator hub found at the heart of Otaniemi campus. All of the organizations serve businesses of varying sizes located in the Espoo area. The initiative to move in together creates momentum to rethink the collaboration of these organizations, as well as how public services are provided to businesses in the city. Our final proposal outlines an actionable strategy to enhance and consolidate the organizations’ service offering, and unify them into what we call Espoo Business Services. This report outlines the strategy, and gives an overview of the process of research, analysis and development that served as a basis for the proposal. All projects were really impressive and inspiring. In particular, KYKY project seems totally worthwhile as far as it helps schools join more actively to the co-creative projects. It is unbelievable that all of these projects are done by students, since those look quite professional.